In December 2013 the New Cumnock area experienced a period of severe rainfall which resulted in widespread flooding when the Nith, Afton and Connel rivers burst their banks. 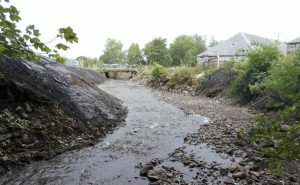 Following this East Ayrshire Council employed a specialist consultant to identify the flood risk associated with these rivers and assess options for the alleviation of future flooding. Our specialist consultant concluded that direct flood defences be constructed to protect the communities threatened by future flooding. Phase 2 Afton is at detailed design stage and will be brought forward in the near future. 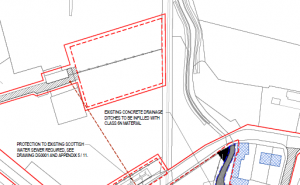 The Phase 1 Leggate works which are being funded by East Ayrshire Council and the Scottish Government essentially comprise water retaining flood embankments and associated overspill structure and reinforced concrete walls. 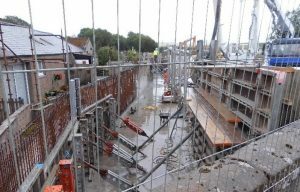 The works are progressing well with the South Boig Farm Field works and embankment complete. The field works included lowering of the field level to facilitate flood water passage and grass seeding was carried out by Mr Smith the farmer. The embankment works involved the construction of clay embankments to keep flood waters within the river channel and also to re-direct flood waters outwith the river channel along a specific flow path. 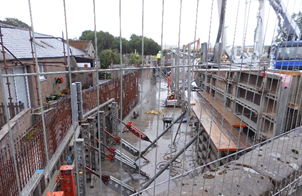 All concrete channel works including the placing of support beams are now complete. 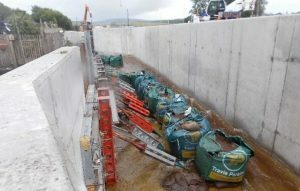 Additional works were carried out to install a High Strength Screed to the floors of the existing culverts. Earth reinforcement works and rock armour protection to the right hand bank of the river are on going. 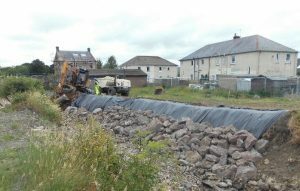 Knockshinnoch site clearance and bulk excavation works have commenced with excavation and realignment works on the left hand bank of the river.